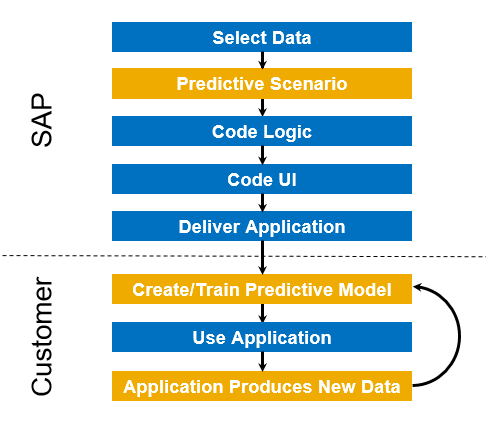 In this blog, I would like to talk about the newest addition to SAP S/4HANA Cloud Embedded Analytics, namely Predictive Analytics. With our general concept, Embedded Analytics, which brings the formerly separated worlds of a BI system and an ERP system together, we have already made a huge step forward from a “system of records” to a “system of intelligence”. If you are interested in learning more about Embedded Analytics, I highly recommend Anirban’s blog. Watch this video from Orla Cullen, explaining the new predictive features in the SAP S/4HANA Cloud 1705 Release. With SAP S/4HANA Cloud 1705 we go even beyond this, as with this release, Predictive Analytics is added to our strong analytical capabilities. With Predictive Analytics, we add the possibility to leverage machine learning models to enrich the basis for decision making, for example, by forecasting the future value of a KPI and therefore help to anticipate. 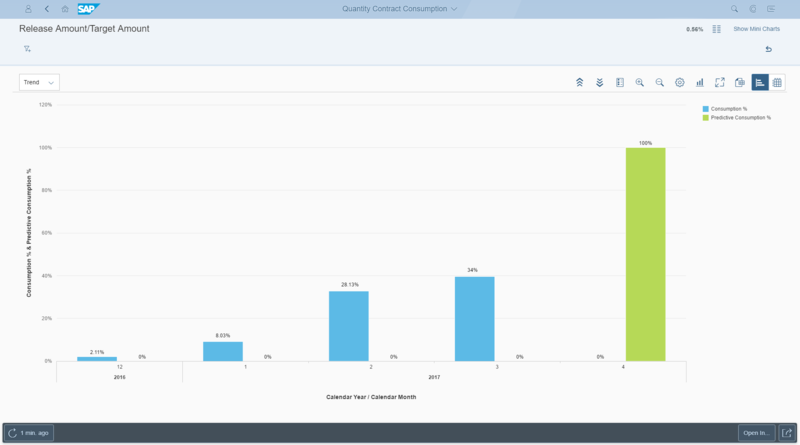 A role model on how to integrate Predictive Analytics and Embedded Analytics in SAP S/4HANA is the “Quantity Contract Consumption” app, which is available as part of the buyer role. This app has already provided an exhaustive overview of the company’s purchasing contracts and their status, such as the contract start and end date, supplier, material, the current consumption, and much more. With this app, it is possible to closely analyze the purchasing contracts and to take appropriate actions such as renegotiations. While the buyer has all the capabilities to analyze the contract directly in the system, he must still track the contracts actively and relate the current status of a contract to the circumstances. This means, for example, that a contract with a consumption of 80% might still last for more than three months as there is low monthly consumption compared to the contract volume. On the other hand, there might be a backup contract, which is only consumed by 40% and has already been there for months. If the main contract now expires and needs to be renegotiated, the backup contract is consumed much more than before and would be consumed within a few weeks. To avoid such situations, the date of the contract’s full consumption is predicted using machine learning algorithms. The buyer can now identify the contacts, which should be renegotiated soon, and manage the contracts proactively. This gives the opportunity to avoid suboptimal conditions and to better prepare renegotiations. From an end user’s perspective, almost nothing has been changed. The app now contains the additional measure “predicted consumption” in the trend view as well as the predicted fully consumed date per contract in the document view of the app. The user might not even know, that a machine learning model is working in the background. Nevertheless, machine learning models are said to be complex and cumbersome to create and maintain. But this does not hold true for Predictive Analytics apps which are delivered with SAP S/4HANA as we use the SAP BusinessObjects Predictive Analytics Integrator for integrating Predictive Models in business applications. To understand how we do this, let us have look at the app creation lifecycle for standard Embedded Analytics apps, which is depicted in the picture below in blue. First, based on the selected data, the calculations and logic is implemented. With the SAP Fiori framework, the UI is created and the app is delivered. For Predictive Analytics apps, we add a layer, the Predictive Scenario, between the data selection and the coding of the logic, which is a predictive model container. As we know for our apps which data is needed, we predefine the input of a predictive model and as we know what the end user’s interaction will be at the end, we can also predefine the output of the model. This enables us to develop the app end-to-end. Machine learning models are so powerful, because they mimic the behavior of historical data. If a pretrained model was delivered with the app, the model would not be able to perform well on data in the customer system. Here the Automated Predictive Library (APL) inside the HANA database comes into play. The APL optimizes machine learning models automatically and without a data scientist. This way, we are able to deliver the application with the predictive model container and the actual predictive model is trained on live customer data, that never leave the SAP S/4HANA system – not even for training. The step of model creation and activation at the end is done by the Analytics Specialist, who is in business departments a power user for analytical tasks. While the model training is a one-click action, the assessment of the model is also highly simplified. The model evaluation is based on a star rating between 0 and 5 stars, where 5 stars depicts a very good model. With this model rating the analytics specialist decides, if a predictive model shall be activated. If the evaluation is positive, the model is activated and the predictive capabilities of the app can be leveraged. When the usage of the app yields new actual data, you might want to reflect this in the predictions. For this, the model can be easily retrained, so that the updated model is used for new predictions. As simple as that. Thank you for your interest! Can you elaborate on frontend? Is it the windows-based “SAP BusinessObjects Predictive Analytics” Frontend – either Automated or Expert More or are you already using Predictive Factory – you mention “model training”. I assume this is more than that Fiori “Quantity Contract Consumption” app. In principal the “Predictive Analytics Integrator” is a seperate product, but I assume in that very case you used it internally for developing the application. So a customer does not need to use that, or cannot even use it in that case. thank you! Indeed, we only use apps within the S/4HANA Cloud 1705 system. The “Quantity Contract Consumption” app is available for the role of the buyer and the app for model training and management “Predictive Models” is available for the role of the analytics specialist. This means that under the hood, the customer uses the Predictive Analytics Integrator when training and managing the predictive model. We at SAP used it to provide the Predictive Scenario which is a kind of Predictive Model Container. Am I right that those are the two apps?